How To Be A Forex Trading King Uncovering The Secrets Of How To FOREX Trade Like A King This bunde is made up of Andrew Johson's masterpieces on FOREX Trading, which includes:Forex: A Beginner’s Guide to Forex: Uncover the Secrets of Forex AND Forex: The Ultimate Guide to Forex: Uncovering Forex Profit Making SecretsWhile it can be relatively easy to begin trading in the forex market, it is ultimately much more difficult to find true success within its confines in the long term as a few bad trades can easily be enough to wipe out even the most promising trader no matter what their intentions might ultimately be. 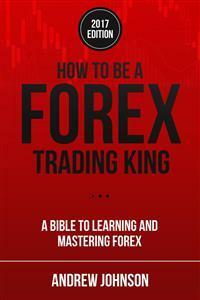 If you are interested in learning the specifics of how to stick around in the forex market for the long term then How To Be A Forex Trading King is the book that you have been waiting for. This book combines two of Andrew Johnson's FOREX masterpieces. Inside you will find:	Forex- What is it and What is its History? Being Successful with Forex Managing Your Money as You Use Forex Candle Stick Strategy Price Action Strategy Pivot Point Strategy The Turtle Strategy Scalping Moving Averages Strategy Tips and Tricks for Trading on the Forex	The types of trading strategies that the professionals are likely to use every single day along with tips and tricks to ensure that you make the most of them every single day. The best volume indicators to use regardless of what type of trading you prefer and how risk-adverse (or not) that you may be. Three easy tips that anyone can use in order to improve their successful trade percentage virtually overnight. One of the most effect ways to take advantage of the forex market’s high level of volatility without losing your shirt. The most common mistakes that forex traders of all skill levels continue to make and how to avoid them. And more…If you are serious about learning and mastering FOREX trading then grab your copy today! Sign Up & Join Andrew Johnson’s Mailing List! Never miss my next FREE PROMO, my next NEW RELEASE or a GIVEAWAY! Chapter One: Forex- What is it and What is its History? So you want to trade on the Forex? And so much more that is going to assist you in making money on the Forex! Congratulations on downloading Forex for Beginners and thank you for doing so. The following chapters will discuss what Forex is, how you can use it to be fruitful, and several strategies that have proven to be successful when using Forex. While Forex may seem complicated, if you get into it at the right time and do not rush, then you are not going to have any problems. Forex is going to be difficult to get rich off of right off the bat, but you can make some modest money on it if you manipulate it properly. There are plenty of books on this subject on the market, thanks again for choosing this one! Every endeavor was made to ensure it is full of as much useful information as possible; please enjoy! Forex is otherwise known as the Foreign Exchange Market. This is a market that is used for trading different currencies as well as buying and selling the currency at a predetermined price. The main participants of the market are usually the International Banks, as well as financial centers around the world. The unique thing about the Foreign Exchange Market is that the market is open 24 hours a day, excluding the weekends. The prices of the currency are not determined by The Exchange Market but rather by the market price of the given currency. Currency prices change every day because the Foreign Exchange Market is a fluctuating market - this means that the market changes on a regular basis. While the larger International Banks are known as the forerunners for the market, the smaller banks that work with the market are referred to as the dealers that end up doing the most trade of foreign currency. What a bunch of people do not understand is that there is a behind-the-scenes market known as the interbank market. The market assists in international trade between countries such as the United States and Europe. The market helps to convert the currency based on the interest rate of the coin for the market that day. A typical market transaction is one party paying different currency that is not their own with their own currency based on the currency exchange prices. The Foreign Exchange Market as we know it came around in the 1970s after there were three decades of many restrictions on Foreign Exchange. As I've stated, the Foreign Exchange Market is very unique - not only because it is open 24 hours a day, but for many other reasons as well. One of those reasons is the volume in which trade occurs. Another reason is where all the currency is actually dispersed, as well as the many factors that will affect what the exchange rate is. As previously stated the market has no set fixed income oruse as leverage to enhance the profit-and-loss margins. This causes it to be known as the closest idea to what is perfect competition would be, notwithstanding currency intervention that was created by the central banks. The first known trading of currency goes back to ancient times. People would change money by taking a commission or charging a service fee. People would use city stalls at the times of the great feast in the temples, or they would use a money changer which was also known as a silver or goldsmith. The Byzantine government held a large monopoly on theexchange of currency during the fourth century. And in 8 BC, the exchange of coins in ancient Egypt was controlled by Demetrius, according to Papyri PCZ 59021. Exchange of currency was necessary because it was a way for people to buy and sell different items such as Pottery, raw materials, and food. The buying and selling of various goods what helped to stabilize the economy. For example, if a Greek coin held more gold than an Egyptian coin, the merchant would barter fewer Greek gold coins for more Egyptian ones. This is why most world currencies in circulation today have a fixed specific value. Banks were opened at foreign locations during the 15th century by the Medici family. This was done in order for the currency to be exchanged on behalf of the textile Merchant. A Nostro account was a book that held amounts of foreign and local currencies in order to be traded. An active Forex Market was maintained by the Amsterdam government in the 17th century. This acted as an agent between the kingdom of England and the country of Holland or trade in 1704. During the 1850s Alex Brown & Sons were the leading participants for foreign exchange in the United States. Then in the 1880s de Silva applied for and became involved in the foreign exchange trading business with the Banco Espirito Santo. The gold standard began in 1880, and it's also the source of the modern foreign exchange markets. Before the First World War, international trade was limited. But with the onset of war, the gold standard system was abandoned. The country's foreign exchange increased at an annual rate of 10.8 percent between 1899 and 1913, while gold increased at an annual rate of 6.3% between 1903 and 1913. At the close of 1913, half of the world exchange was conducted using the pound sterling. Also during this time, London increasedfrom 3 banks to 71 that were involved with trade. But in 1902 there were only two foreign exchange brokers in London. In the early Twentieth Century, the most active in trade were New York, Paris, and Berlin. But, Britain remained uninvolved until around 1914. For the year of 1924, the number of exchange Brokers within London went from 17 to 40. The Kleinwort family was the leader of the Foreign Exchange Market in the twenties. Some significant FX Traders were known as Japheth, Montagu & CO., as Seligman. In 1928, Forex Trading became an intricate part of the financial functioning of the city. Due to the Continental exchange controls and many other factors in Europe as well as Latin America, any attempt at commercial prosperity was hampered. The Bretton Woods Accord was signed after World War II in order to allow currencies to fluctuate within a range of 1%. During the year of 1954, Japan changed its foreign exchange law, and the bank of Tokyo became the Centre for foreign exchange. Also, between 1954 and 1959, the Japanese laws made the inclusion of more Occidental currencies in the Japan Forex. When the Bretton Woods Accord ended, exchange rates of currency brought in a free-floating currency system. However, after the Bretton Woods Accord ended in 1971, the Smithsonian agreement came around allowing the trade to range up to 2%. Due to this, the foreign operations done by the US Federal Reserve were low. Not to mention that those that were involved in controlling the exchange rates found that the boundaries of the Smithsonian agreement were unrealistic leading it to be closed in 1973. During the years of 1978 to 1973, the amount of trade in the Foreign Exchange Market increased by three folds. This also led to the market being a split Market so that there were dual currency rates although this was abolished in 1974. Given the ineffectiveness of the Britton Woods Accord as well as European joint float, Forex markets were forced to close during 1972 and 1973. However, the largest of all purchases was done in 1976 by the West German government where it purchased almost three billion dollars. Because of this, there is an indication that balancing exchange abilities was impossible due to the measures of control at the time. Markets in West Germany as well as other European countries closed for 2 weeks during 1973 and resumed in March of the same year. When 1973 came around, banking trade as well as foreign exchange control ended and the free-floating market came to be. It is recorded that the first time a currency pairs would be given an option for the US traders to purchase was during the year 1982, and additional coins became available the very next year. The People's Bank of China allowed for individual domestic enterprises to participate in the foreign exchange during the year of 1981. Also, during 1981 the forest controls that the South Korean government place we dropped allowing for free trade to occur. Then in 1988, the country's government accepted the IMF quota used for international trade. During 1987, the greatest portion of all trades was done within the United Kingdom slightly over one-quarter, where the United States became the second most involved in trading. Iran changed their International agreements 1991 from oil barter to Foreign Exchange bartering. Even though you are just starting out, you want to be successful with Forex. It is unavoidable because it is something that is ingrained in all of us. But, since you are just starting out, how do you become successful? Many traders who are just getting started on the market are unprepared for what they are getting themselves into. The Forex market, much like a human, has a life cycle and if you do not understand this life cycle, then how are you to know what you need to do to be successful? Therefore, not understanding leads to the trader losing their accounts in which case they end up giving up or doing the proper research to help them learn what they need to do.